November Home loan approvals in Australia fell b 0.9% MoM, not as bad as the 1.5% decline expected, though in AUD terms, the decline was 2.2% MoM as the unit value of approvals fell. The 0.9% decline in home loan approvals in November was not quite as bad as the 1.5% decline expected by forecasters, though this is based on the number of approvals, and the value still declined at a 2.2%MoM rate, not far off the AUD 2.5% decline in October. Nevertheless, whilst the direction of the run of approvals is disappointing, there seems to be no acceleration in its decline, and this looks like an orderly adjustment rather than the onset of any dramatic loss of confidence in the housing market, which might spill over into faster house price declines. A couple of regions even saw a pick up in approvals, including Victoria, though again the AUD value comparison reverses this conclusion. There was a slightly faster pace of decline of home loans for investment purposes, which is not surprising as home prices continue to decline, but at 4.5%, this was not too eye-popping either. 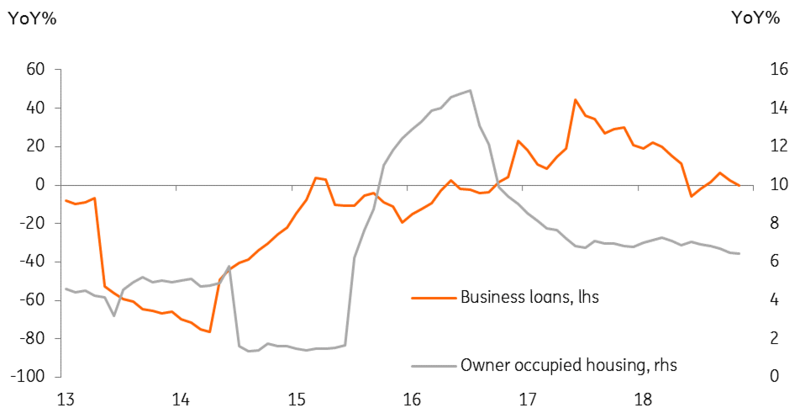 Compared with a year ago, bank lending for owner-occupied housing is still running a positive rate, though we would expect this to diminish over the coming months. Business loans and advances, on the other hand, are no longer growing versus a year ago. Separately, yesterday's release of the January Westpac- Melbourne Institute consumer confidence data, showed a 4.7% MoM fall. This more timely data provides grounds for continued caution on the outlook for Australia, though the level of confidence remains satisfactory, it does not support a conclusion of near-term improvement. WIth this mixed economic backdrop, we are expecting further downside to emerge in the AUD this year, and view consensus forecast expectations of RBA rate hikes in 1Q 2020 as too optimistic. Admittedly, the labour market remains strong, but we are concerned that this may reflect past strength, rather than indicate a reason for future optimism. Bank bill futures still point to cuts in 2020 rather than hikes. This is probably too pessimistic, But in any case, the case for an RBA hike within 12 months time looks very weak.